As you can see, my obsession with pesto shows no signs of stopping soon! We love this pizza dough because not only does it have just 2 ingredients, it’s quick and easy to make and bake. None of this waiting around for dough to rise, because who has time for that? Not me, that’s for sure. To twist the words of the hulk, don’t make me hangry, you won’t like me when I’m hangry! This dough makes one full sized pizza but can be easily doubled. I know my pizza making is a little unorthodox because not only is it made with just flour and yoghurt, it’s flipped half way through cooking, but really no one will care when the recipe gives a perfect pizza every single time. So although this recipe is meatless, it’s not strictly veggo because parmesan cheese is not actually vegetarian. 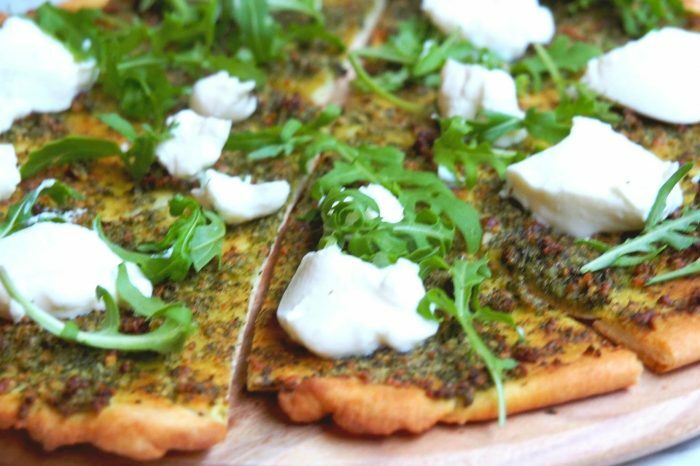 That said, there’s no need for vegetarians to miss out on this pizza perfection, they can skip the parmesan in the original pesto recipe entirely and swap it for 3 tablespoons of nutritional yeast flakes. 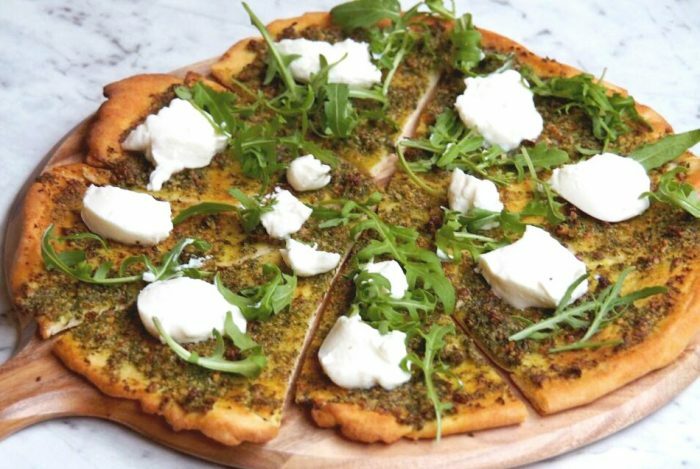 Although, this will change the flavour profile and the consistency of the pesto, you can easily get away with it on the pizza because it’s going to be smeared with ricotta and rocket, and there will be such a flavour party in your mouth, no one will miss the parmesan, I promise! I love this kale and basil pesto because the flavour is sublime, but feel free to use whatever pesto you have to hand, whether it be shop bought or homemade. This pizza may be green, but it’s not mean. It’s just all kinds of delicious! Preheat the oven to 200C /180C fan-forced. Mix flour and Greek yogurt together in a bowl. Transfer to a lightly floured work surface and knead the dough, adding more flour as needed to keep dough from being too sticky, for about 8 to 10 minutes. Lightly grease a 12-inch pizza pan and spread dough to edges of pan. Bake for about 5-7 minutes until just golden at the edges. Remove from the oven and carefully flip the base over using a spatula. 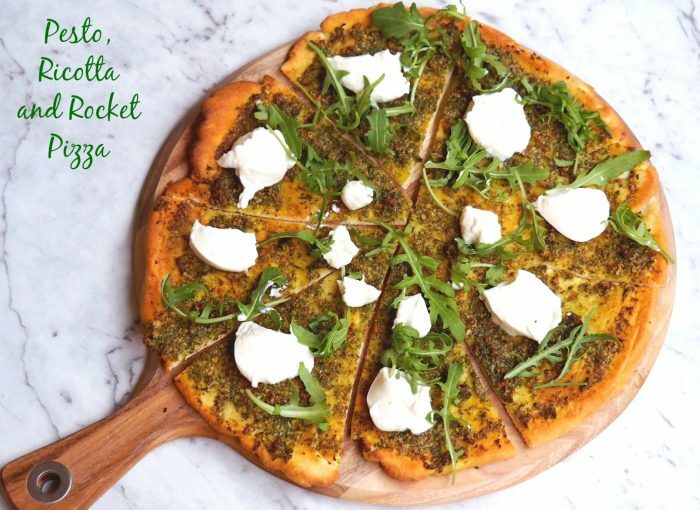 Spread the pesto over the base, right up to the crust and drizzle with a little olive oil. Return to the oven for another 5-8 minutes until the edges are golden. Dollop the ricotta and scatter the rocket all over the pizza. Finish it off with a drizzle of olive oil and a good grinding of black pepper. Add flour and yoghurt to TM bowl and mix for 6 seconds on speed 6. Set the dial to closed lid position and knead for 1 minute on interval speed. 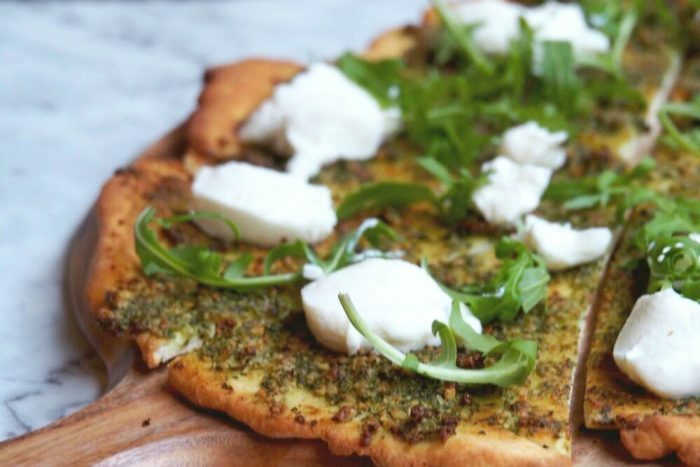 Turn out onto a lightly floured board and roll out into a pizza shape. 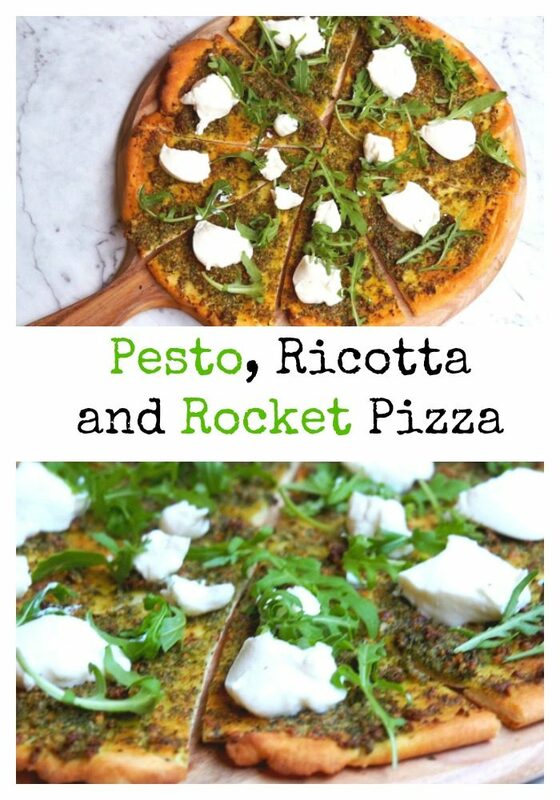 Remove from the oven and dollop the ricotta and scatter the rocket all over the pizza. Finish it off with a drizzle of olive oil and a good grinding of black pepper.